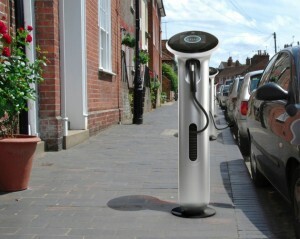 04-10-2010: GE Introduces Residential Smart Grid-Compatible Electric Vehicle Charger. Combining functionality with consumer friendly form from renowned industrial designer Yves Behar, the GE WattStation on average decreases electric vehicle charging time from 12-18 hours to as little as four to eight hours compared to standard charging “level 1”, assuming a full-cycle charge for a 24 kWh battery. “The residential GE WattStation design is friendly and so simple to adopt that it will literally change one’s life overnight: No more trips to the gas station, something that surely no one will miss,” said Yves Behar, founder of fuseproject. The residential GE WattStation is designed to help accelerate the adoption of plug-in electric vehicles by significantly decreasing time needed for vehicle charging and, using smart grid technology, allowing utility companies to manage the impact of electric vehicles on the local and regional grids. GE has partnered with ServiceMagic, the nation’s leading website connecting consumers with service professionals, to provide a network of certified electricians for reliable installation of the residential WattStation in the consumers’ home. In addition GE Capital, working with ServiceMagic, will provide financing options, enabling consumers to pay for the charger and installation costs over time. 14-07-2010: GE’s WattStation is an easy-to-use electric vehicle (EV) charger designed to help accelerate the adoption of plug-in electric vehicles (PEV) by significantly decreasing time needed for vehicle charging. Its smart grid-enabled technology could also help utility companies manage the impact of EVs on the local and regional grids. GE teams with Nissan on electric car smart charging. With plug-in vehicles on track to create a revolution in the auto industry, the race is on to build a smart-charging infrastructure that can support the millions of cars that one day will be plugging in.